Resources for observance of 11 Days of Peace. Includes events on and off campus, links to related websites, daily mediations, and more. See the Global Peace Index and the latest peace news. Watch how people all over the world are participating in International Day of Peace. 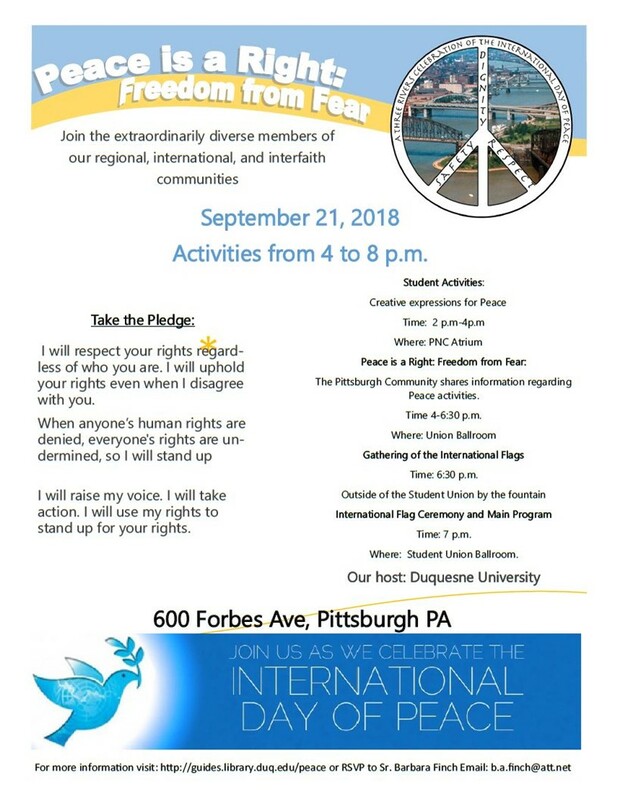 The International Day of Peace ("Peace Day") provides an opportunity for individuals, organizations and nations to create practical acts of peace on a shared date. It was established by a United Nations resolution in 1981 to coincide with the opening of the General Assembly. The first Peace Day was celebrated in September 1982. In 2002 the General Assembly officially declared September 21 as the permanent date for the International Day of Peace. "Peace Day should be devoted to commemorating and strengthening the ideals of peace both within and among all nations and peoples…This day will serve as a reminder to all peoples that our organization, with all its limitations, is a living instrument in the service of peace and should serve all of us here within the organization as a constantly pealing bell reminding us that our permanent commitment, above all interests or differences of any kind, is to peace."